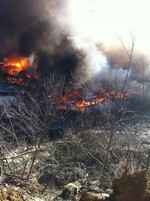 The fire engulfed one of the buildings in the rear of the Mill Street complex of warehouses and businesses. Photo by Doreen Brodmerkel. Doreen Brodmerkel took photos from her home off Route 32 that overlooks the fire as it engulfed buildings at the Cornwall Industrial Park on Sunday. Click on a photo for a larger view..